A group of retired Gurkhas joined Gurkha Company Catterick and members of the local community to raise money for the victims of the Cumbrian floods with a Christmas and New Year fundraiser. 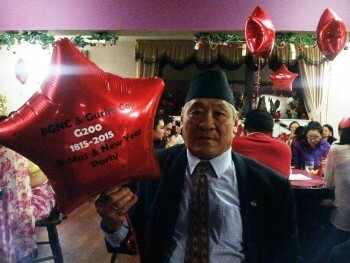 Over 200 people attended the event, which raised more than £300 and was organised by the British Gurkhas and Nepalese Community (BGNC) and Gurkha Coy Catterick. It was held at Catterick Golf Club in Yorkshire on Saturday 19th December 2015. It’s over a month since Storm Desmond flooded the county, leaving many towns and villages completely devastated. The Cumbria Flood Recovery Appeal has so far raised a total of £4.35m since its launch on Saturday 5th December 2015. See this page for various ways to donate to the Appeal.